My Domestic Monastery: Minimize the Mess - Review and GIVEAWAY! Minimize the Mess - Review and GIVEAWAY! Recently, I had the opportunity to interview Rachel of Efficient Mama for an upcoming episode of Little House Mothering. Rachel recently released her new book, Minimize the Mess. She gave Amy and I each a copy to review for the podcast...and I just had to share my thoughts with you. I enjoyed this book for so many reasons, but here are my top five! Not only is Minimize the Mess an easy read, but it's also possible to read it in the course of one naptime. I find it so satisfying to actually accomplish something during naptime, so I was happy to be able to say that I had read a book by the end of the afternoon. One of my favorite parts of the book was a list of the questions that Rachel asks herself before she makes a purchase. I don't want to spoil it by giving them away, but I really loved that they were both practical and getting to the heart of how the purchases we make tie into what matters to us. This book is just so practical. She breaks everything down into manageable steps, and encourages you to complete your purging at a pace that works for you and your family. I've been in purging mode for a long time, and our house isn't overly cluttered at the moment, but I feel like even I was able to find some suggestions that hadn't occurred to me! Inspiration no matter where you are on your purging journey. Like I said, I've been purging and minimalizing for a while now, but it really is on ongoing process. I like that Rachel's book acknowledges the fact that you won't be done with purging all at once - but also that it's okay to not do it perfectly. She says something along the lines of, "There's always the next purge!" Reassuring and encouraging, all at once! 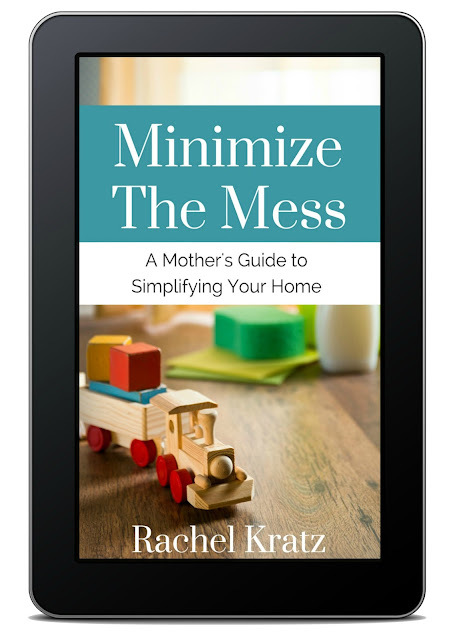 Rachel is generously offering a free copy of Minimize the Mess to one lucky winner. See the Rafflecopter below for details. May the odds be ever in your....well, you know what I mean. Older children to watch the younger children :) Some days I don't know how I did it without them!